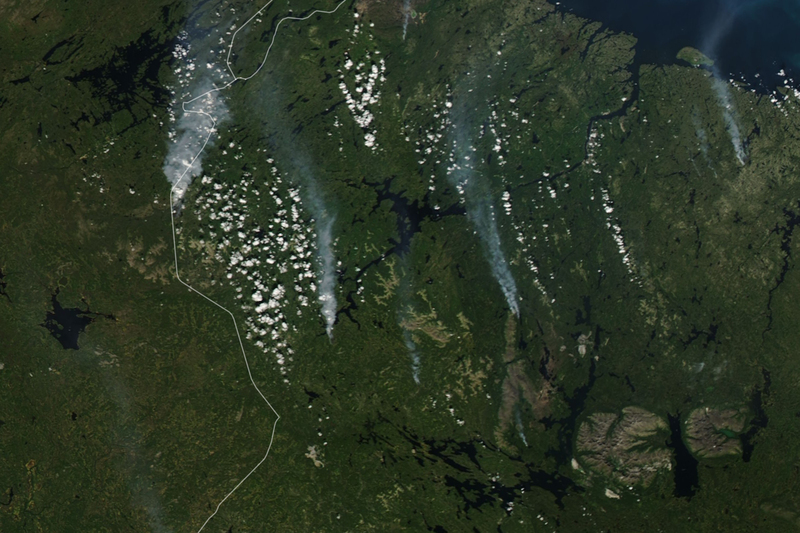 Scorching, dry conditions are spurring historic wildfire outbreaks across Sweden this summer. On July 19, 2018, more than 40 fires dotted the country, causing firefighters to scramble and hundreds of people to evacuate their homes. The Swedish government called for international assistance—the second time this summer—and received firefighting airplanes and helicopters from Italy and Norway. 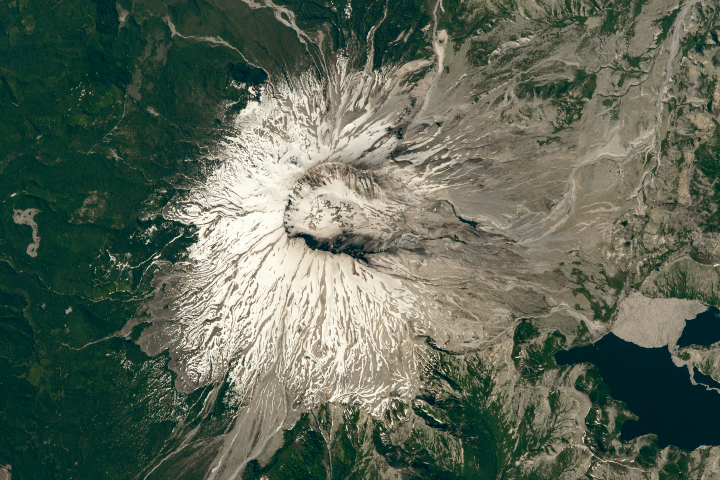 The natural-color image above was acquired by the Moderate Resolution Imaging Spectroradiometer (MODIS) on NASA’s Terra satellite on July 17, 2018. The largest fire was near Ljusdal, although Kårböle, Jämtland, and several towns have been evacuated due to fires. No fatalities have been reported so far. The Copernicus Atmosphere Monitoring Service forecast model shows an increase in fine particulate pollution above the fire-stricken areas this week. The intense fires are unusual for this time of the year, as Sweden's summers are normally mild. In May 2018, several cities experienced their hottest May days in 150 years of recordkeeping. 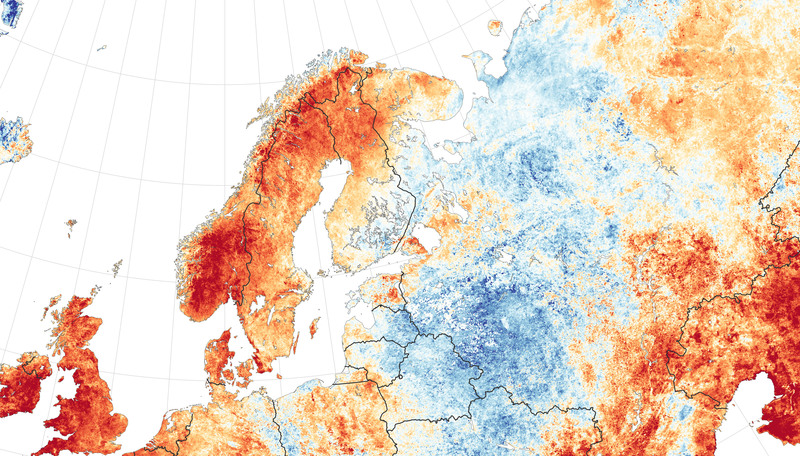 Temperatures cooled off in June, but returned to record highs in July, when Sweden’s national weather agency issued a warning for extremely high temperatures. At the same time, Sweden has experienced very low rainfall this summer. The hot, dry conditions helped create the severe fire risk for the Sweden. 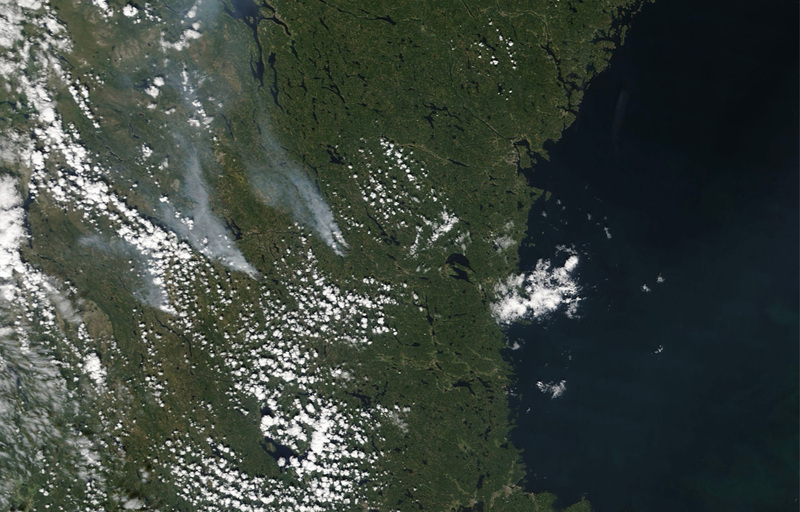 As of July 20, Sweden has over 10,000 hectares of burned land, which is nearly 24 times higher than the amount of burned land averaged over 2008-2017, according to the Copernicus Emergency Management Service. High temperatures and wildfires are also hitting neighboring countries and as far north as the Arctic circle. 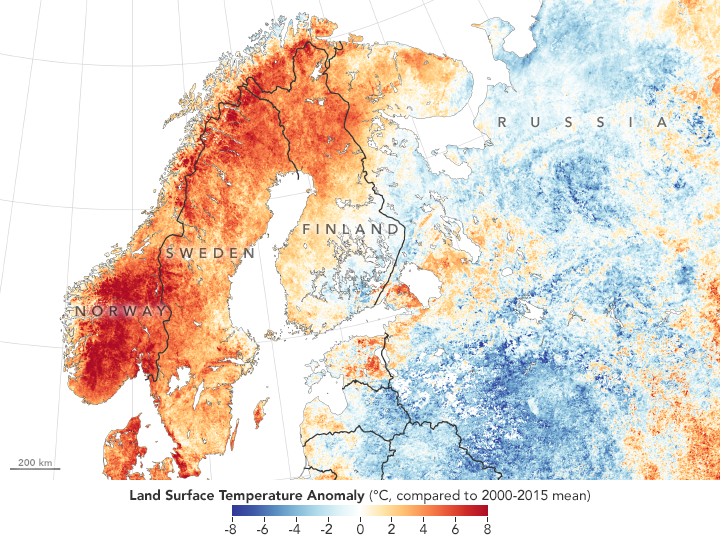 All-time high temperatures were hit in 14 locations in Norway, including Troms county where temperatures hit 33°C (92°F), as the southern part of the country was peppered with fires in 100 localities last week. Northern Finland saw temperatures of 33°C (91°F) on July 18, while wildfires also spread near the border of Finland and Russia. 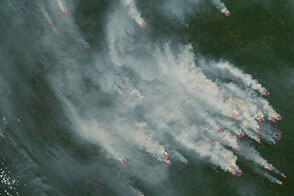 The natural-color image below shows fires near the Russia-Finland border. 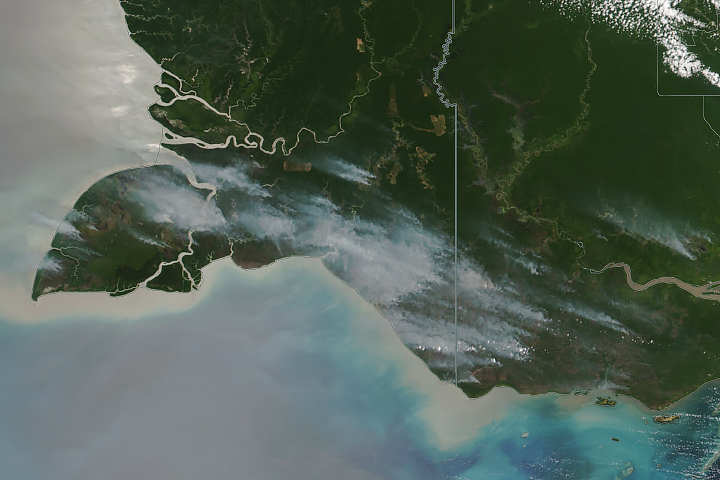 The image was captured by MODIS on NASA’s Aqua satellite on July 20, 2018. 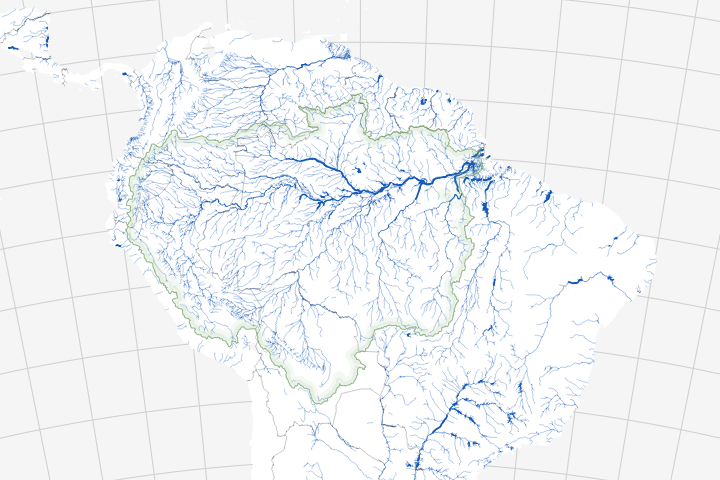 NASA Earth Observatory images by Lauren Dauphin and Joshua Stevens, using MODIS data from LANCE/EOSDIS Rapid Response and the Level 1 and Atmospheres Active Distribution System (LAADS). Story by Kasha Patel. Record-breaking hot and dry conditions have spurred historic wildfire outbreaks in far northern Europe and within the Arctic circle. 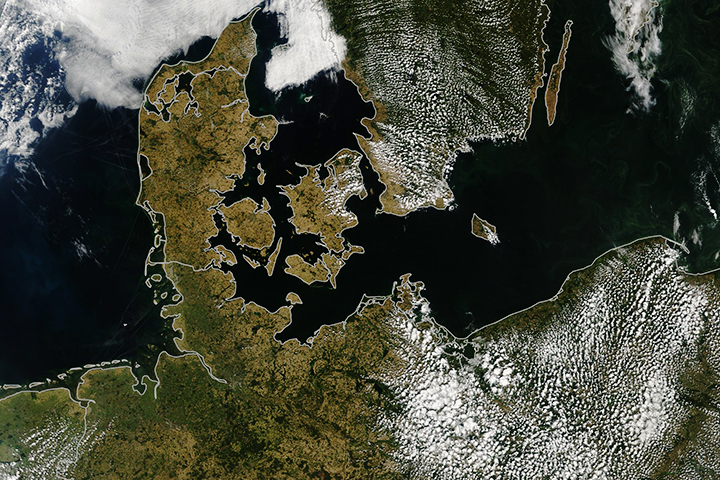 Record-breaking hot and dry conditions have spurred historic wildfire outbreaks and a browning of the landscape in northern Europe and within the Arctic circle. Agence France-Presse (2018, July 18) Sweden struggles to contain ferocious wildfires. Accessed July 19, 2018. Copernicus Emergency Management Service Seasonal trend- Sweden. Accessed July 20, 2018. Copernicus Atmosphere Monitoring Service Particulate matter forecasts. Accessed July 20, 2018. Euronews (2018, July 19) Wildfires rage in Arctic Circle as Sweden calls EU for help. Accessed July 20, 2018. 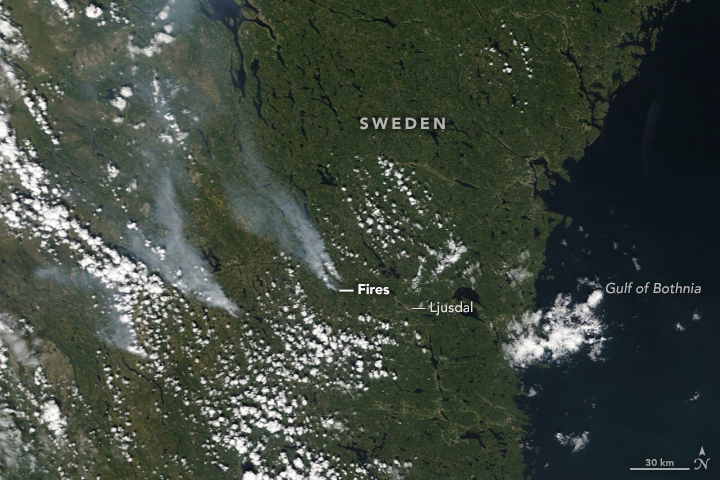 The Local Sweden (2018, July 17) Sweden is battling a historic wildfire outbreak. Here's what you need to know. Accessed July 19, 2018. The Local Sweden (2018, July 17) &slquo;There hasn't been a proper rainfall in weeks&srquo;: Swedish farmers struggle with drought crisis. Accessed July 20, 2018. SOS Alarm (2018, July 19) Information due to the prolonged drought that caused many fires among other things. Accessed July 19, 2018. Sveriges Radio (2018, July 19) Prime minister says Sweden needs to be be more prepared for fires. Accessed July 19, 2018. 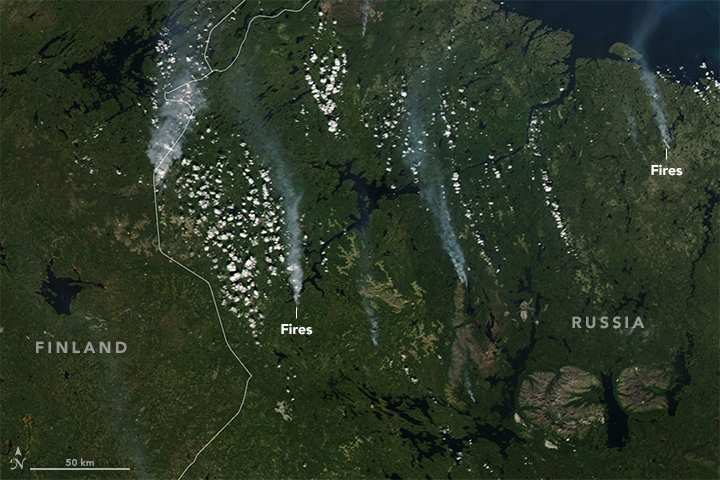 The Weather Channel (2018, July 18) Sweden Wildfires Most Serious in Recent Times Aggravated By Record-Smashing Heat, Ongoing Drought With No End in Sight. Accessed July 20, 2018.